Hello world! My name is Madeleine and I’m completing my undergraduate degree in Honours Urban Studies here at McGill. My primary research interests are concerned with urban development models produced through the interplay between top-down (government, private actor) visions and bottom-up (citizen and grassroots) initiatives. I had the opportunity to explore this dynamic in my honours thesis research, based in Hanoi, Vietnam, specifically in relation to the experiences and impacts of rapid urbanization as experienced by Vietnamese youth (ages 18 to 30). My current research is called Access 21. Here at Building 21, I have been given many amazing opportunities to expand this interest in better understanding the nuanced relationships between citizen, state, and urban fabric in order to focus on how cities are disabling for some and enabling for others. More specifically, how Montreal (focus of my BLUE fellowship project) is experienced and navigated differently by non-sighted individuals. The preliminary idea underpinning my BLUE fellowship was to use visual and auditory platforms in a contained space to immerse the viewer in a ‘Montreal’ experienced by someone who is non-sighted. In doing so, I aimed to encourage critical reflection on the unequal access created by the way we design cities and to highlight the importance of, firstly, including multiple perspectives and stakeholders in urban discussions and, second, to let my interviewees share with the viewer how they themselves use the city’s sounds, smells, and tactile cues to travel in a safe and comfortable manner. Yet, more and more questions and academic curiosities emerged as the fellowship came to an end. I became more intrigued by the notion of incorporating disability as a method to approach (urban) design. In the context of McGill, I wanted to better understand the relationships between interior spaces and how the construction of these spaces of learning create differentiated access through the ways in which they are built. Using the ‘intellectual makerspace’ that is B21, I have prototyped this original idea (explored in BLUE Summer 2018) to focus on Building 21 itself as a proto-public space wherein the ideas and discussions we circulate amongst our communityprivileged circles can have very real impacts on the world outside of our little green door. I proposed at the start of this winter semester to “explore alternative and non-visual modes of spatial knowledge dissemination and co-construction related to enhancing the accessibility of Building 21”. How might the intersection between urban studies and disability studies enhance equitable modes of access and interaction at B21? What technologies and mediums are most appropriate to facilitate these access points and conversations? To reach this aim and answer my research questions, I detailed how I would apply for ethics approval in order to carry out interviews and focus groups with non-disabled and disabled students and staff who were part of the McGill community. Further, I would create an interactive map of the Building 21 space where one could click and see videos filmed by different people interacting with the space in different rooms. Finally, I intended to 3D print braille signs to put in the space. The Access21 project takes the stance that physical disability is produced by disabling rather than enabling micro-geographies, that disability is a socio-spatial experience that is “lived and produced at every imaginable scale” (Gleeson, 1999: 15). Further, I contend that Building 21 functions as a ‘proto-public space’ -- a place functioning as a launching pad for ideas and bridge between the academic community and the general public. Hence, the norms and concepts that circulate in this micro-space can have a positive impact on a larger scale or further entrench social injustices (Wan, 2011). 1. How is the space differentially in/accessible between one person and another? Further, how do different people and different bodies perceive barriers in convergent or divergent ways? 2. In what ways is the B21 space currently excluding physically disabled people? 3. What are the range of barriers in the space and how can this inform future approaches to accessibility at Building 21 and/or the urban university context? This project is thus guided by the intersection (within which a small body of research exists) of Geography (Urban Studies), Critical Disability Studies, and Architectural Theory. In this intersectional space is a conceptual landscape that recognizes the differential access created through societal norms and presumptions about what it means to be ‘disabled’. 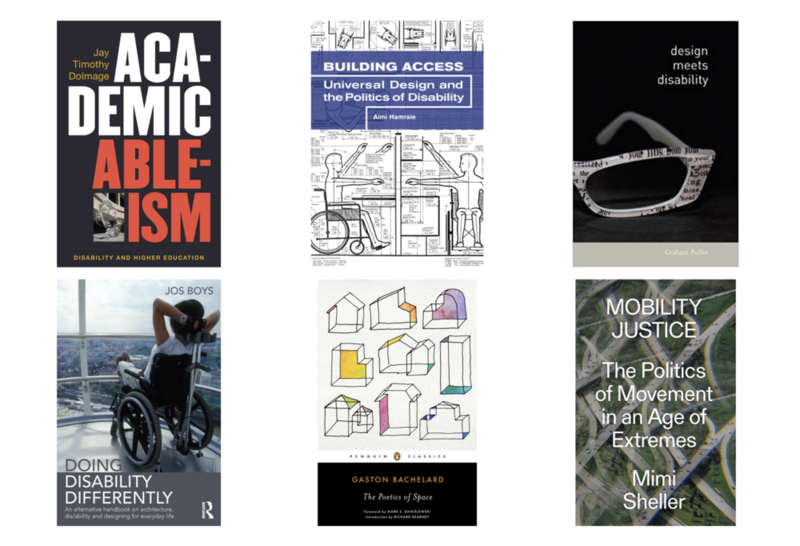 You can see in one of the images here six books that have been influential in my project development at a more theoretical level (or at least beyond the Building 21 space). To ground my research further, I have been actively measuring rooms in Building 21 and re-creating these dimensions in a rough interior map using a software called Revit. While it has become clear to me that the integration of this map with an interactive component available on the web is beyond my current skill set, its relevance is rooted in its ability to convey spatial knowledge that suggests where certain parts of the B21 might be inaccessible to some people. More importantly, and what I find particularly interesting, is how this spatial knowledge is entirely reductive. It fails to share with the viewer the accessibility of ideas that circulate through the space and the openness of the people who are part of our community. Yet, the spatial and social accessibility intersects, in my view, in the simple fact that everyone has been open to and excited for including 3D printed braille in the space. Although questions have been raised about its functionality or essentiality (especially since few who come are non-sighted), its value as simply an aesthetic or ‘different’ type of spatial cue remains. When someone visits the space and sees that we have Building 21 written in Braille—what might this suggest about B21? We encourage radical thinking and exploration, so why not do so through the use of senses that we do not often let dominate? Why not imagine what B21 could look like if the space was free of regulations about historical buildings and budgets were limitless? When it comes to urban design and architecture, accessibility is often an after-thought or a component disregarded through cost-benefit analysis. When people think of ‘accessibility’, many often assume a ramp is sufficient or that a sign to an elevator and an automatic door opening is sufficient. While this may be true to some respects, this project contends simply much more than that. As I write this (April 5th, 2019) I have 21 days to submit my final paper and report. I am still swimming through various concepts and ideas at once and actively attempting to synthesize them through the lens of Building 21 (as both subject and facilitator of this project). Unfortunately, the ethics approval process took longer than expected and was thus granted too late in the semester to put together interviews because this is such a busy time of the year. I have 3D printed one sign so far, all the rest did not come out correctly. However, I still intend to print these using a different 3D printer than the ones available on campus. The intended output of this project is, as of now, a paper that begins by pulling together the conceptual strands I have been working with and overlays them onto the Building 21 space. In doing so, I am constructing a report that looks at the physical and social accessibility of B21 and, in turn, offers spatial considerations were B21 ever to move to another space or to find an additional space as well as ideas for ameliorating the space in its current state. These latter ideas extend beyond spatial notions and into the realm of (university) education. The legacy of ableism in secondary education is one which this project cannot address in its entirety, primarily because its effects are ones which I have read and observed rather than experienced first-hand. As I begin to consider my life after graduation and what it is I want to ‘do’ with my life, the recurring things that come to mind are working with and alongside urban residents to create the spaces that they want to live in. The beauty that has come from this project is the process of learning how to think about spaces differently, to engage critically with a disability studies lens, and to reconsider my own assumptions about access to urban space. I humbly hope that this project, and all its past and future iterations, initiates some form of reflection on the cities we live in, the universities we attend, and the doctrines we unknowingly ascribe ourselves to.